How to update Relates Task & Event Record Owners if Main Record Owner Changes? Lead, Contact, Account or Opportunity record owner is changed. Business wants to make sure that already assigned scheduled Tasks and Events are reassigned to a new record owner. We need to create a Process builder to achieve this functionality. 1. Go to Setup --> Process Builder --> New. Select object you want this change to happen. Make sure to select "when a record is created or edited"
3. 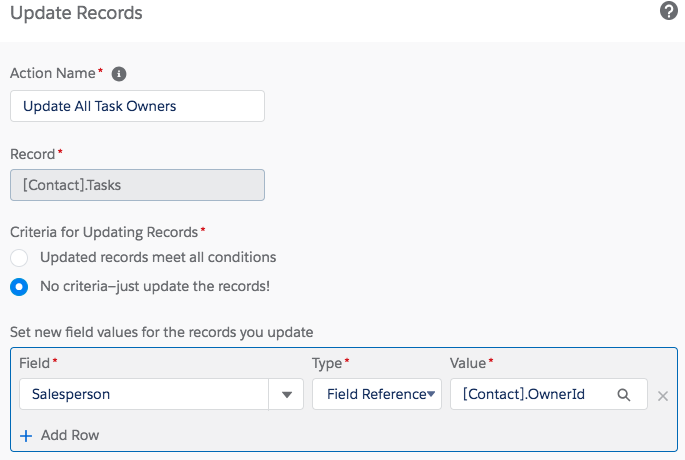 Next select the Related Record Record.Tasks or Record.Events and specify which lookup need to change. 4. This is how final result looks. I am repeating the same Record Owner change process for both types of Activities - Tasks and Events. Please note, record Owner will be only updated for Open Activities. All Activities from the past will remain with the old owner. What also makes sense. How to add Leads / Contacts from Salesforce Campaign automatically to New or Existing List?